Awareness about water conservation is on the increase especially among primary and secondary students. 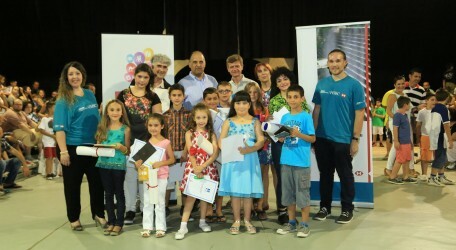 This is evidenced by the strong participation of 963 pupils who took part in a children’s drawing and painting competition themed on water shortage in Malta organised by the HSBC Water Programme – Catch the Drop CampaigThese submissions were exhibited in the ArtZone at Il-Fiera l-Kbira at Montekristo Estates. The art exhibition was organised as part of the Catch the Drop campaign being implemented in Malta by the Ministry for Energy and Health, in collaboration with HSBC Water Programme. Pupils aged 5 to 14 years from various primary and secondary schools were offered the opportunity of having their work exhibited during Il-Fiera l-Kbira.. The Catch the Drop art competition attracted a strong participation making it one of the largest children’s exhibitions ever held in Malta. The students were invited to highlight water shortage in Malta and to show ways on how to prevent water shortage, what brings about water shortage, and why is water so important. Category A (5-7 years) are Luca Saliba (De La Salle), Alessia Finocchiaro (Sacred Heart), Anthea Camilleri (St Nicholas College – Baħrija Primary School), Emma Vella (Sacred Heart). Category B (8-10 years) are Alana Fava (St Margaret College – Zabbar Primary A), Aimee Grech Bonnici (Chiswick House School), Loryana Mallia (St Benedict College – Mqabba Primary School), Matthew Xerri (St Edwards). Category C (11-13 years) are Mariah Amber Busuttil (St Thomas Moore College – Girls Secondary School Santa Lucija), Gabriel Bonnici (De La Salle), Matthias Bugeja (De La Salle), Alexia Cortis (St Ignatius College – Handaq Secondary School). During the prize-giving ceremony, Mr Glenn Bugeja, HSBC Water Programme Coordinator and Ms Anna Maria Gilson, Service Manager Projects & Initiatives Section, Directorate for Educational Services, presented the prizes for the best creative works. All participants were presented with a certificate of participation. At Il-Fiera l-Kbira, HSBC Bank Malta exhibited an information stand with 12 posters in connection with HSBC’s Water Programme and Catch the Drop campaign. Various water projects are being organised throughout a strategic 3-year campaign in Malta which is funded by HSBC Group and supported by Ministry for Energy and Health. The programme encourages positive change towards the use of sustainable fresh water use in Malta.